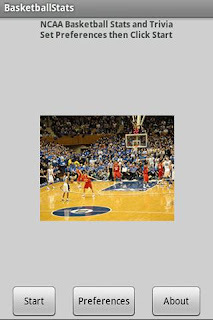 In the NCAA Basketball Quiz game for Android (by developer monjod), players test their knowledge of college basketball history, statistics and trivia. The player can select 10, 25, or 100 questions to answer, and select an easy or standard level of difficulty. Questions are chosen at random from a database of over 200. Categories include career and season records, prominent coaches and players, history of the game, and some rules questions. This quiz game enables players to compete around the globe using Swarm's online leaderboards system. Think you've got what it takes to be the best? Download NCAA BasketBall Quiz for Android and give it a shot! Yep, it's a pun (and it's okay to laugh if you want to).